These plantings are part of the GreenLife Woods initiative, launched by Forests Ontario and GreenLife DelRidge Homes in April. GreenLife Woods will support the planting of 140,000 trees on behalf of GreenLife East Markham I and II, the latest Net Zero condominium development from GreenLife Del Ridge Homes. This Saturday, Forests Ontario, GreenLife Del Ridge Homes, the City of Markham, and 45 volunteers from the community came together at Milne Dam Conservation Park to plant 1800 trees. We were honoured to be joined by Mayor Frank Scarpitti of Markham who thanked everyone for the day's efforts. 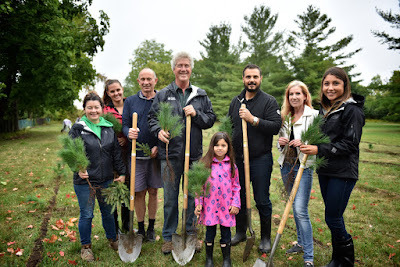 The planting brought a close to a successful planting season in which Forests Ontario and GreenLife Del Ridge Homes worked together to plant 80,000 trees across Ontario. These plantings are part of the GreenLife Woods initiative, launched by Forests Ontario and GreenLife Del Ridge Homes in April. GreenLife Woods will support the planting of 140,000 trees on behalf of GreenLife East Markham I and II, the latest Net Zero condominium development from GreenLife Del Ridge Homes. GreenLife East Markham integrates technical innovations to produce more energy than it consumes, including onsite electricity generation through wind and solar sources. GreenLife Woods further complements GreenLife Del Ridge Homes' commitment to eco-friendly building. "Del Ridge has shown incredible enthusiasm and commitment to this initiative," says Rob Keen, CEO of Forests Ontario. "Del Ridge is not just offsetting the impact of their new development, but contributing to a network of healthy forests that will serve as a major asset in addressing the challenge of climate change." Dave de Sylva of GreenLife Del Ridge Homes notes, "To our knowledge, we are the first builder in Canada or even in North America to take such a proactive step to build responsibly. We are committed to the environment and we hope that GreenLife Woods will inspire other builders to join us and partner with organizations like Forests Ontario to secure the long term health of our natural ecosystems." Forests Ontario would like to thank all the volunteers who joined us at Milne Dam Conservation Park and extends our gratitude to GreenLife Del Ridge Homes for their continued support of thriving forests across Canada. Forests Ontario and Del Ridge Homes look forward to continuing our partnership to restore Canada's forests in 2017.